Today any 1892 Morgan silver dollar value is a minimum of $18.63 each. These old coins are heavy with over ¾ ounce pure silver, forming a high base price. Your coin however is one that needs close inspection to determine its true value. First to consider, which of the four mints producing silver dollars at the time struck the coin? Collectors place significantly different values depending on the scarcity of silver dollars from certain mints. These different mints are identified by "mintmarks" placed on the reverse. Refer to the image just below the value chart for a close-up view of the mintmark location. Next is study the condition of your coin. Rare coin dealers and collectors avidly search for nice condition coins. Top quality is rare with 1892 silver dollars and value really takes off in the "uncirculated" condition. Example: So few 1892 dollars from the San Francisco mint remain in uncirculated condition today only one or two trade yearly. Potential valuable mintmarks and possible above average condition, both determine 1892 Morgan silver dollar value. 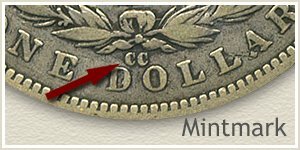 Even in heavily circulated condition value of the 1892 "CC" mint marked dollar is well above minimum silver bullion. Mintmarks found on the reverse identify the mint that struck the coin. Carson City a "CC" the San Francisco mint used an "S" and New Orleans an "O." If there is no mintmark, the main mint in Philadelphia struck your coin. Now is the perfect time for you to understand the difference between an "uncirculated" and "circulated" silver dollar, both on a technical and visual side. Technical: First, "shiny" does not mean your coin is the desirable uncirculated condition. Many today still retain a bright silver appearance, however, it is the presence of wear that decides between the uncirculated condition or a circulated (worn) grade. The telling indicator of wear is the disruption of mint luster. The highest parts of design are first to receive any wear and removal of luster, evident particularly on Liberty's cheek. Additionally when handled the open flat fields quickly loose luster and begin to have a dull to bright two toned look. 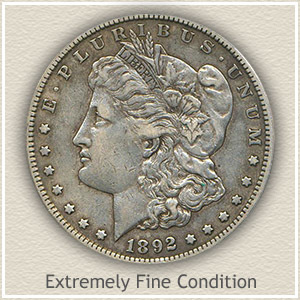 Although subtle to detect when slight, the absence of any wear, greatly increases 1892 silver dollar value. Visual: When first struck silver dollars exhibit a distinct luster. The striking process imparts to the surface minute flow lines of metal radiating from the center to rims giving the coin a cartwheeling effect of brightness. Of special note: as these old silver dollars age a natural toning of silver often begins to develop and lay atop the surface. Toning is not an indication of wear. Unbroken, radiating luster across all surfaces confirms the uncirculated grade. Under magnification, an inspection of your coin really brings out the subtle differences needed to decide if wear is present. Rotating the coin under light and judging the luster is complete across all surfaces discovers the higher end uncirculated condition. The degree of wear (hopefully none at all) is a little hard to gauge but is one step that needs attention. Following the lead of collectors, examine the condition of your 1892 dollar closely. As you compare your coin to the images, a close match of its condition becomes apparent. This process determines the "grade" and using the above chart identifies an accurate value of your 1892 silver dollar. 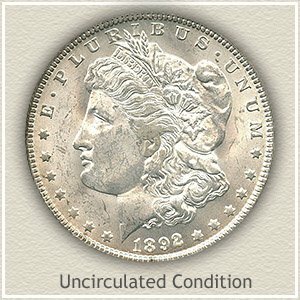 Uncirculated: Is your 1892 Morgan silver dollar value at a premium because of "uncirculated" condition? An uncirculated coin is without any wear to its surfaces. Original silver mint luster still covers all design details. Holding your coin by the edges, and by tilting and slowing rotating, unbroken bands of luster radiate from edge to edge. Any wear disrupts these bands, most evident on Liberty's cheek. Extremely Fine: Slight wear of design limited to only the tops of the highest points, defines the "extremely fine" grade. Loss of detail is minor with the merging of just a few strands of hair found above Liberty's forehead and below her cap. Folds in the cap also show small amounts of rubbing with a tiny loss of roundness. Your coin still retains a pleasing sharpness in appearance. 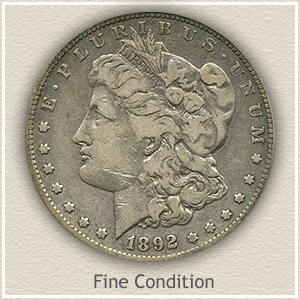 Fine: Moderate wear and moderate loss of detail reduces Morgan silver dollars to the fine grade. Although wear is apparent, major design elements of her cap and hair curls remain bold and recognizable. However those original fine details are lost and replaced by flat areas. Good: Lack of design defines this old silver dollar as "Good" condition. Liberty is mostly an outline, once a cap, hair curls and head band are now obscured. Lettering now connects to the rim in places but readable. Lack of any hair line above the forehead places this coin solidly in this lower grade. If showing excessive wear, value of your silver dollar is likely tied closer to its silver content than a higher collector value. Unless it is the Carson City issue. 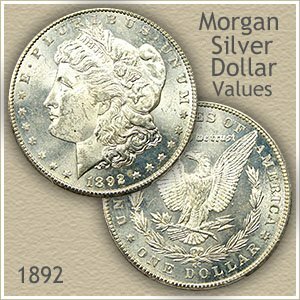 Many rare and valuable dates and mintmark combinations are found throughout the entire 1878 through 1921 history of Morgan silver dollars. With a minimum value of $17.98 and rising from there, accurately determine how much your rare silver coins are worth. 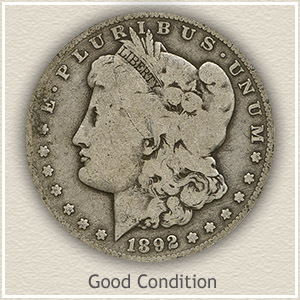 Including more relating to your 1892 Morgan silver dollar value. These early dollars are becoming valuable. Easily find how much your old coins are worth. Covering Bust Dollars beginning in 1794 next Seated dollars through Morgan and the last of the Peace silver dollars. 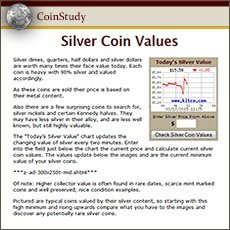 All include value charts, alongside grading images to find the accurate value of your old dollars. It is an excellent index with images and text links to all coin series, from Cents to Gold. Value charts, grading images and descriptions uncovers the common to rare coin values found in your box of old coins. 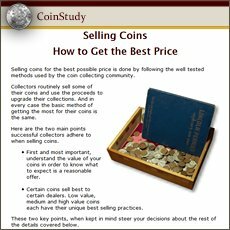 Recommendations on basic supplies that greatly improve coin storage. Providing for safe handling, preserving of value and organizing your box of old coins. Old silver dollars need a certain amount of careful handling to maintain their appeal to collectors. Housing them safely is covered in the Safe Coin Storage article.